Carrie Underwood will be on the silver screen this holiday season, well at least her voice will. 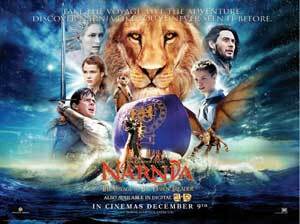 Underwood, has co-written the title song, “There’s A Place For Us” from the upcoming film The Chronicles Of Narnia: The Voyage of the Dawn Treader, scheduled to hit theaters on Dec. 10. A rough cut of the film was shown for Underwood, together with co-writers Hillary Lindsay and David Hodges. Producer Mark Bright was also part of the team. “There’s a Place for Us” will receive major broadcast and online debuts this month, and will be available for purchase exclusively at iTunes on November 16th.